Below you will find footage, of the my cat, the Evil Genius who rules my home and heart. This is a fur ball of extraordinary talent and fuzziness. I introduce you to the Resident Fur Ball. My cat, god love the furry fuzzball, is one of the stupidest creatures know to man, or so I use to think, until I finally sat down and looked at some salient facts. Fact 2, is simply adored by all who sees him, and fussed to death. Fact 3, we keep buying toys in the vain hope he will play with something longer that two bats of his paw. Fact 4, he is getting on in age, and was never a spry fellow to begin with, so we keep helping him up on to our various beds, and chairs. Fact 5, he doesn’t get thrown over the balcony for scratching up the furniture! He gets yelled at, but he just looks at you with the ‘Wha, wha’d I do?” Look, and all is usually forgiven. Fact 6, we keep feeding him! So you can feel the question coming here, who is the stupid one, me or him? He can’t help it! And neither can I. He is just so adorable. 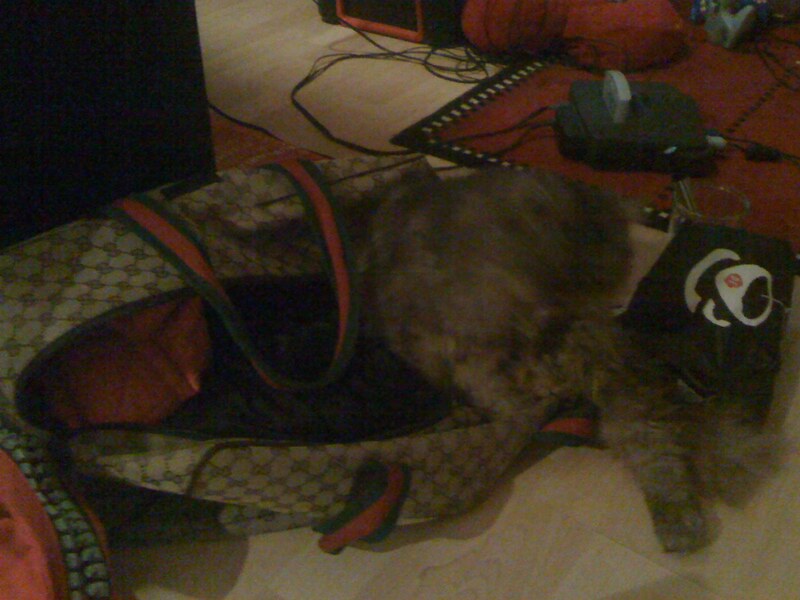 And yes that is him making himself comfortable is one of my well known famous brand bags!